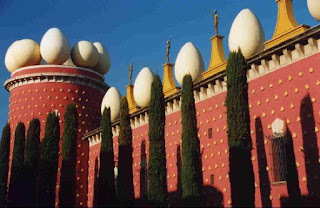 The picture illustrating this blog is a wall covered with loaves of bread which decorate the rear wall of the Salvador Dalí Museum in Catalonia. It was chosen because I have just completed my first novel writing retreat in Spain, close to Dalí’s birthplace of Figueres. There was something magically surreal about the week, the absence of the reality of my life in North London. At home, I go to bed listening to police and ambulance sirens. In Camós, there was silence, broken only by the bell-like call of a scops owl. I woke to the sound of cuckoos. On this retreat there were morning workshops that covered six different aspects of novel writing. Lunch was then served on the terrace and, in the afternoons, I offered one-to-one tutorials. Each evening before dinner, we had a showcase night where students read and received feedback on their work. Some course members arrived with manuscripts they’d been working on for several years, others with just the germ of an idea. Novel themes included the history of the North Tyrol after World War I, a boy whose dead twin speaks to him and the unrequited love of an undertaker and his long-suffering housekeeper. On the chefs one night off (the incredibly-talented Lee Pennington and Debbi Reid), we had gin and tonics, followed by a meal in Banyoles whose lake was the location for water sports during the 1992 Summer Olympics. We ended the week with a fiesta. To get a flavor of the course, click here to view the video which featured the talented Catalan musicians, the Bel and Sammy Duet. I’ll be back in Camós next year for two workshops: a novel intensive, followed by a retreat for those who want time to write and receive extended tutorials. Click on the respective links above for full details. Stay tuned . . .